Chris and Tina came out for a Colorado vacation visit! They arrived last Saturday in the morning. Michale and I took them to The Huckleberry for lunch. Then we took a nap since their flight was stoopid early. We went in to Boulder and strolled around the Pearl St Mall. There were some good street performers out that day. Sunday we all attended the now semi-annual Uncle Eddie breakfast at Lucille's. It was delicious and fun. 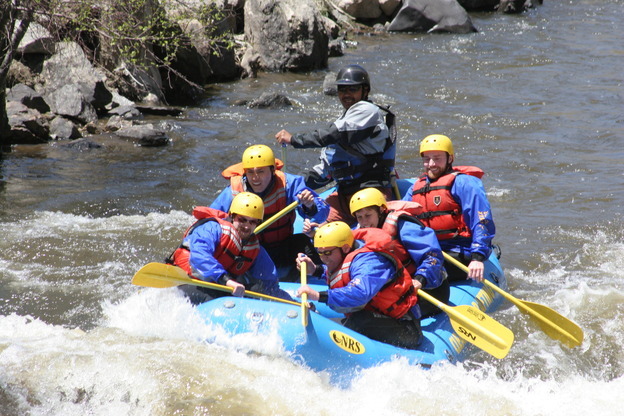 Then Chris, Michale, and I went up to Idaho Springs for some white water rafting! We got a brief safety lecture, put on wet suits, booties, splash jackets, PFDs and helmets, and then headed downstream with five clients and one guide in our raft. We did the "intermediate" level trip and it was a lot of fun. The guide makes it a bit overly dramattic, barking out rapid fire rowing instructions that seem not entirely necessary, but it was a really fun outing and not exhorbitantly priced. We went over rapids, got splashed a bunch, huddled down in the center of the raft going over falls, and Michale even got to drag one of our dim-witted companions from another group back into the raft when he tumbled out! Afterward we hooked back up with Tina and walked into downtown Louisville to dine at the Empire Lounge. Monday morning Chris, Tina, and I drove down to Colorado Springs for a visit. We first took the Cog Railway to the top of Pike's Peak. It was cool views going up the mountain. The weather was severely windy and cold at the summit. It was 17 degrees with wind chill to -10 and winds initially running 60 mph or so. We couldn't make it even from the train to any of the peripheral view points because it was so cold and little dirt and rock particles were pelting us in the face. After only about 10 minutes, the wind hit 90 mph, which we were told is hurricane levels, and everyone had to immediately reboard the train so we could head down and back to safety. At this point decent size hunks of rock were being hurled through the air as everyone covered their faces and made a mad dash for the train. It was pretty thrilling and a big relief to get out of there. The wind was so strong that it took down a tree further down the mountain, and the tree crashed on some power lines which fell across the cog railway tracks. So we ended up stuck in the train waiting for the power company to clear the downed lines for an hour or so. We ate at Adam's Mountain Cafe and checked out the big arcade next door full of old arcade games. 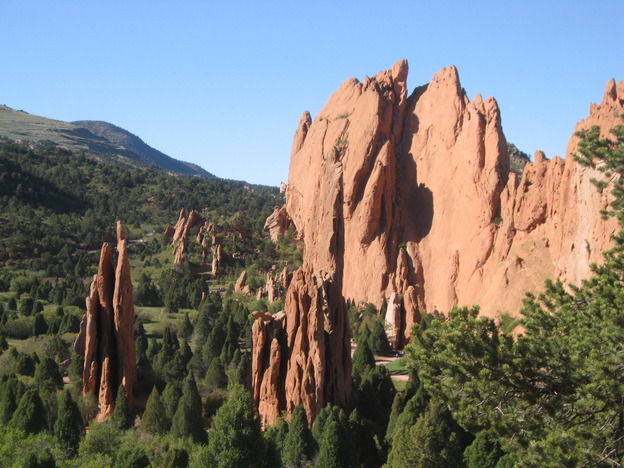 Then we went to the Garden of the Gods park. That was really nice. The weather was gorgeous and we frollicked around looking at the amazing rock formations. We had dinner in Colorado Springs that night with some yummy guacamole prepared table side. After we checked into our motel, I had to go scouting for suitable wifi access somewhere as I was planning to work remotely while Chris and Tina went sight seeing on Tuesday. I tried the Manitou Springs library. They had working wifi and a sort of OK table for me to sit at, but my VPN software was blocked by their firewall. Grr. On to the second library. This one was closed for RFID conversion. Grr. Third library was OK though. Ended up at the Sand Creek branch and they had free wifi with decent speed and even though the used the same service provider as the Manitou Springs library, for some reason my VPN worked OK. This whole search took two hours, which is pretty typical. I missed my amazing home office. So I worked from there Tuesday while Tina and Chris went to the Cave of the Winds. It was a bit challenging working from there and there was no good lunch available, so I fell back to my lifesaver - my trusty Chocolate Chip Peanut Crunch Clif Bar. At the end of the day Chris and Tina came back in the car and we hit the Manitou Cliff Dwellings, which was interesting but just a little. We still had some daylight so we went over to the famous fancy hotel The Broadmoor and snooped around a bit, which was actually a lot of fun. Then we stopped at the Ritz in Colorado Springs for dinner before getting on the road back home to Louisville. I was working the rest of the week, so they borrowed my car and did a few local attractions: the Denver Zoo, the Botanical Gardens, the Celestial Seasons factory tour, and the Silver Plume steam train. 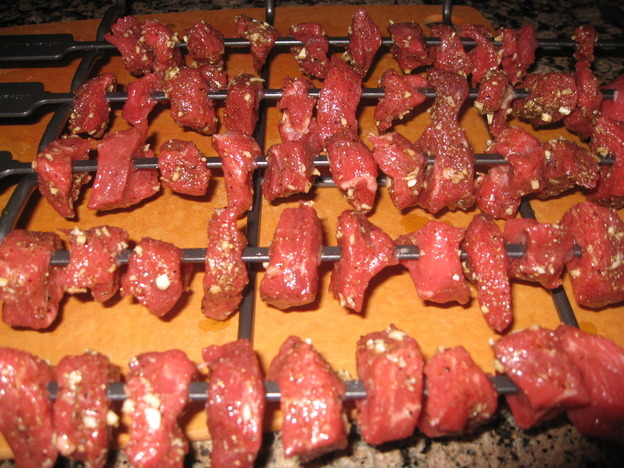 Thursday Tina cooked us some delicious apricot-and-mint-glazed lamb skewers, and Friday I did some rotisserie chicken. The rest of the photos from Chris and Tina's visit are here . 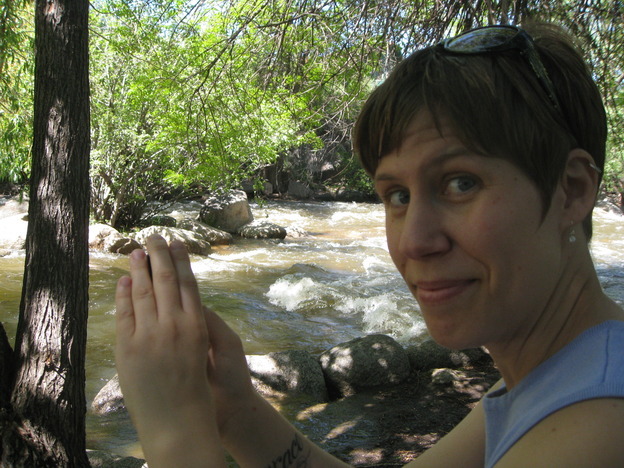 I took them to the airport stoopid early Saturday and then met up with Michale for the Boulder Creek Festival. It's really fun. We love watching the little kids in the giant rubber band kid launchers (they had 2 or 3 of them spread around). On Saturday I got two compliments on my trusty "plain text" white T-shirt. Then a big rainstorm hit just as we came upon Lewis and Nancy by chance. So we hunkered down under the library overpass waiting out the worst of the rain. It did last a good long while despite Lewis's frequent mentions that it would pass in half an hour. Today we ended up having a big yummy pancakes and bacon breakfast and then again spending most of the day at the Boulder Creek Festival. It was nice and sunny and warm today and we walked and walked and walked all over the place, laughing and eating and chit chatting. The rest of the Boulder Creek Festival photos are here . As a side note we've been watching season 3 of The Office on netflix instant. They've really hit their stride now and the episodes are hysterical.